The great window floods the interior with light. New windows and French doors replaced the old wooden doors that accommodated trucks driven up the ramp. 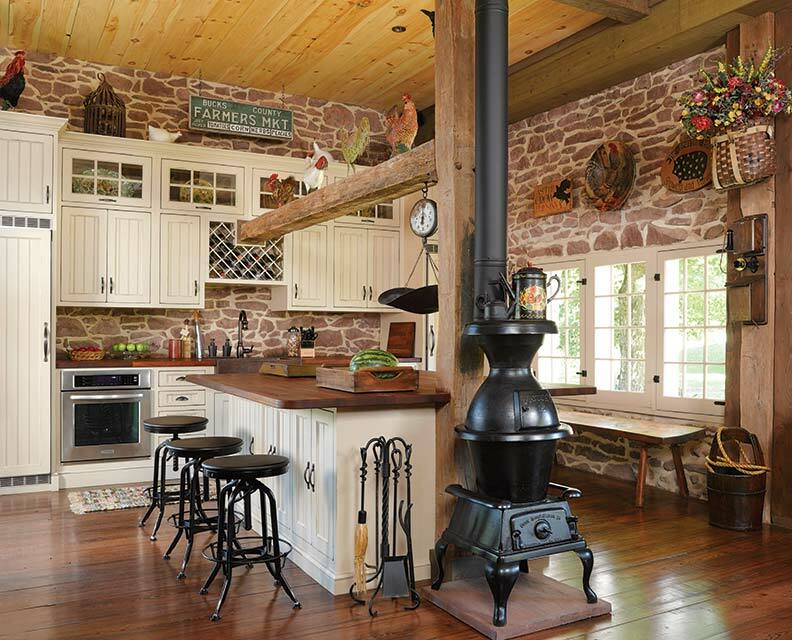 When she talks about the 1822 barn in upper Bucks County, Pennsylvania, you can feel this owner’s passion. She and her husband restored the building, transforming it into comfortable living space. As a family gathering spot, the stone building is the backdrop for new memories in the making for generations of blended family. The rural character of the area was also a draw. But it was the process of restoration that proved especially meaningful. 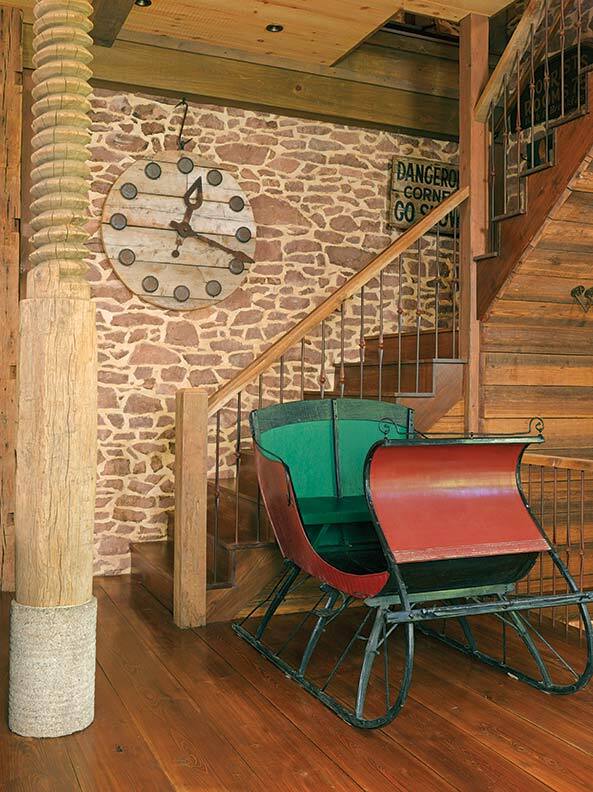 The barn was constructed of a local Pennsylvania brown sedimentary stone known as red argillite. 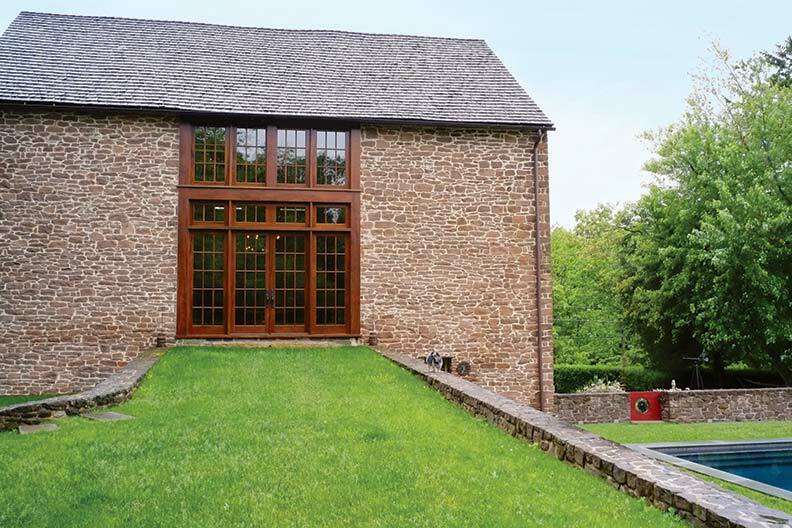 A bank barn (one built into a hill or with a ramp to allow ground-level accessibility on two levels), it was originally a dairy barn serving the family in the small stone farmhouse next door. In the 1940s, it was converted to house chickens instead of cows. By the time today’s owners saw it, the barn had stood unused for years. Its roof was full of holes, horsehair plaster was emerging from between the stones, and various sorts of wild animals lived inside. 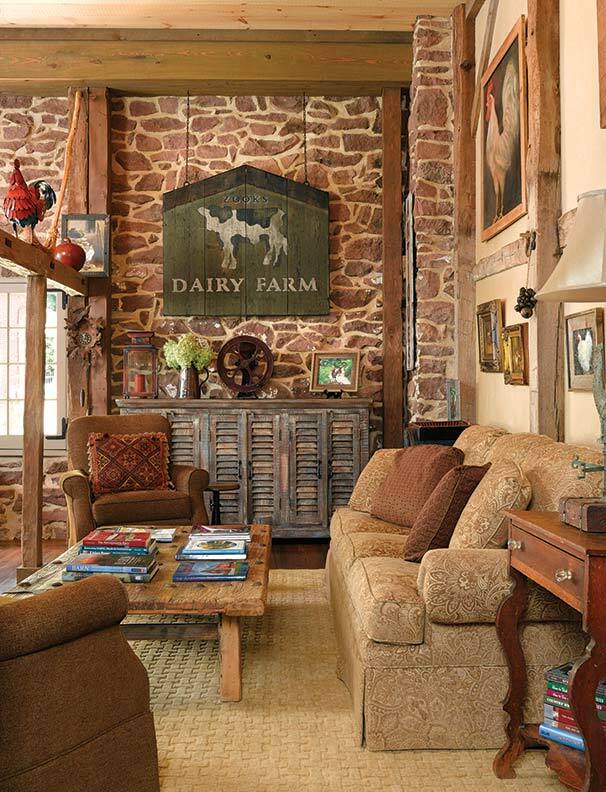 Opposite the big window at center, the living room pays homage to the barn’s history with chicken and cow motifs. The couple bought the house and the barn and, when the old schoolhouse went on the market three years later, they bought that, too. After years of restoration work, they can come here weekends and vacations, often with their children and grandchildren. The homeowner and her husband stay in the 1816 farmhouse, host big family meals in the barn, and put up extra guests in the schoolhouse. The new owners installed running water, electricity, a septic system, heating, and air conditioning. They built and installed new windows and constructed stairs and lofts on the upper level of the wide-open space. They designed interior spaces around the existing posts, beams, and floor levels, and enclosed space only for the two bathrooms, one on each level. In the kitchen, simple white-painted cabinets were installed around the barn’s posts and beams. “We did not drywall any of the walls because we wanted to keep it looking like a barn,” she explains. “There’s a step up from what used to be the threshing floor to the kitchen. We had to design the kitchen around the barn’s frame, which included incorporating a post when building the island, and designing the cabinets to accommodate a beam. 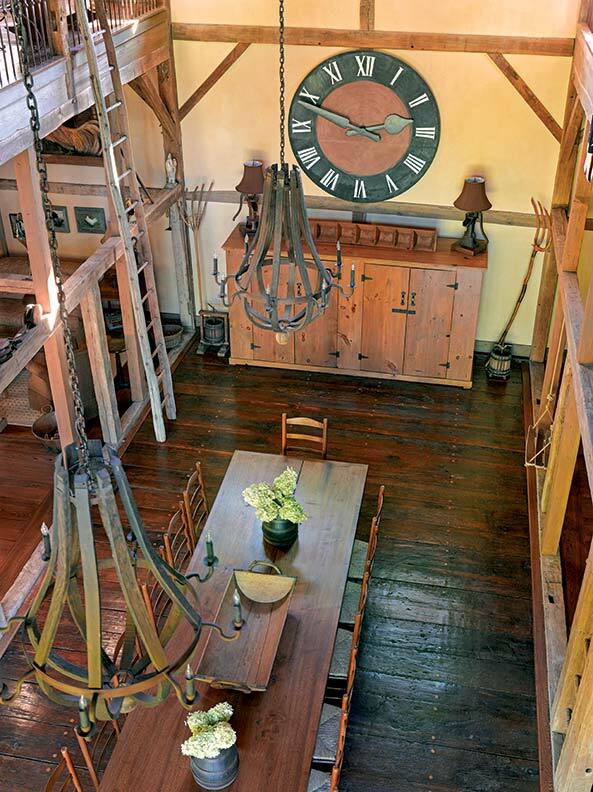 The dining room occupies what was originally the barn’s threshing floor, distinguished by extra-thick floorboards. The 14&apos;-long table was built from a black walnut tree downed in a storm. The large-scale chandeliers were made from wine barrels in Belgium. The homeowner prides herself on the fact that she and her husband restored and furnished their stone barn without the aid of either an architect or interior designer. “It was our vision, our design sense and color scheme, etc.,” she says. “I was the general contractor and dealt directly with each craftsman. I was fortunate to have a great crew to work with, and a patient husband.” They took their time, scouring antiques shops for furnishings. 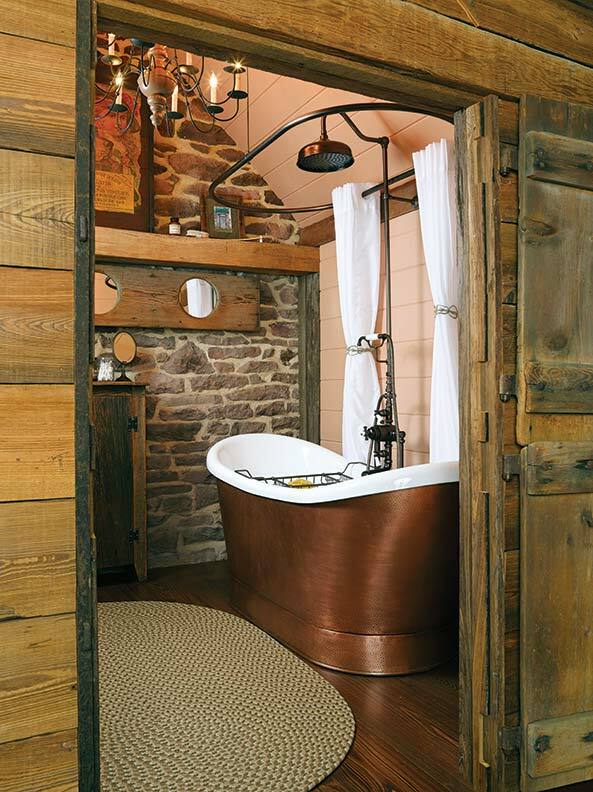 The upstairs bathroom is whimsically imagined as a rural outhouse, complete with a metal roof. It divides the sleeping loft; quilts hung on wire afford privacy. 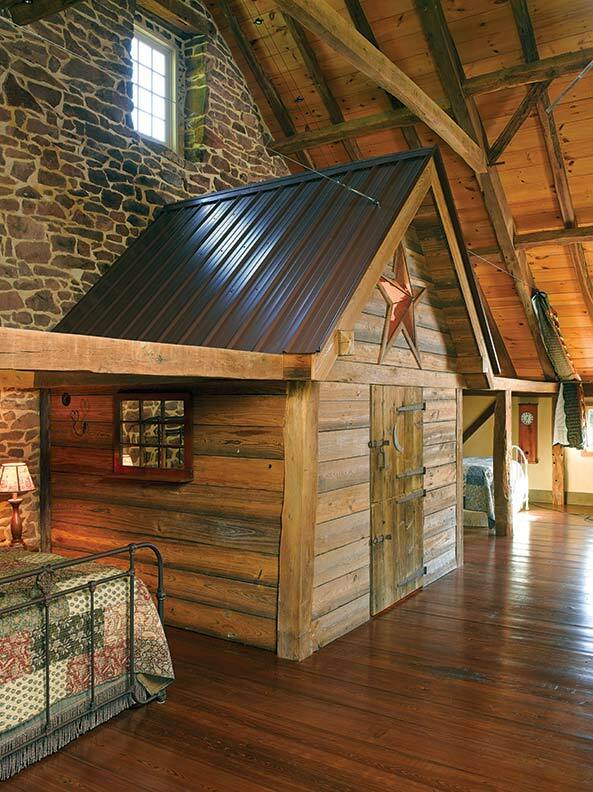 The barn interior is now comfortably furnished for family gatherings. What was once the threshing floor is the dining room, one step down from the adjoining kitchen. The centrally located living room is comfortable with upholstered furniture. 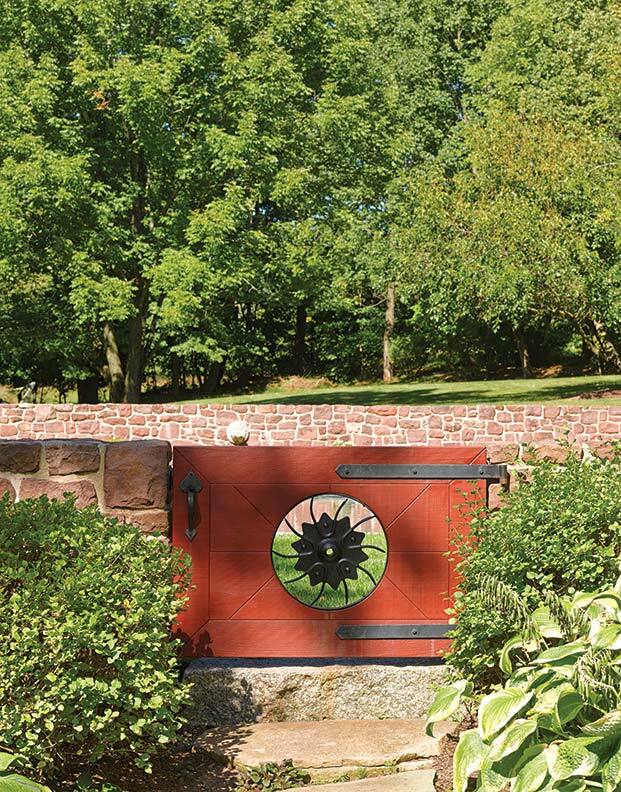 To honor the barn’s years as a poultry house, the homeowner has created a whimsical theme with collectibles and art that have a chicken and rooster motif. The dairy barn history gets a few nods. Clocks, of special interest to the homeowner, are a striking element of the interior design. A favorite feature is the upstairs bathroom. Situated between two loft bedrooms, it takes the form of an outhouse, complete with gabled metal roof and a crescent moon cut into the Dutch door. A large star made by a local glass artist fills the gable above the outhouse door. An actual wooden three-seat outhouse bench became the frame for the mirror! 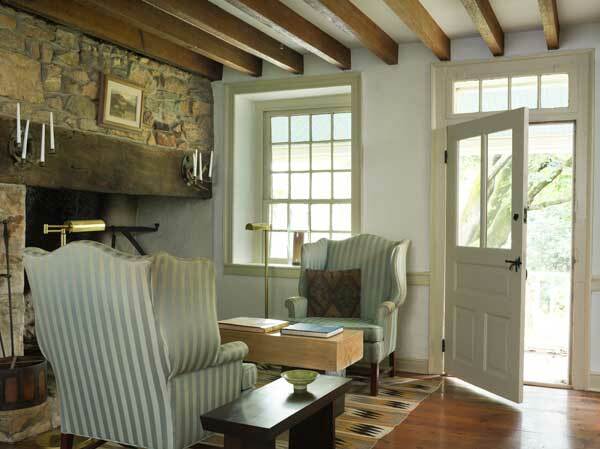 Built near Philadelphia during the height of the Colonial Revival, a stone house becomes more authentic with talented owners. 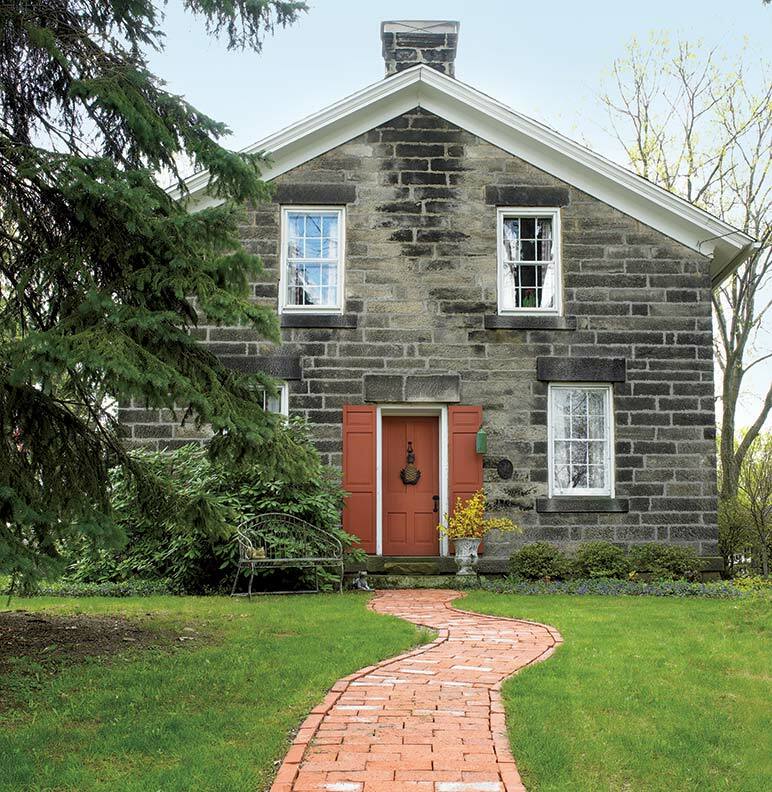 Restoration of this stone house has taken decades of respectful work by its owner, a designer who is inspired by Shaker design.